2-axle light diesel switcher class V15 of DR (fallen flag railroad operator in former East Germany), presented in the original blue color. 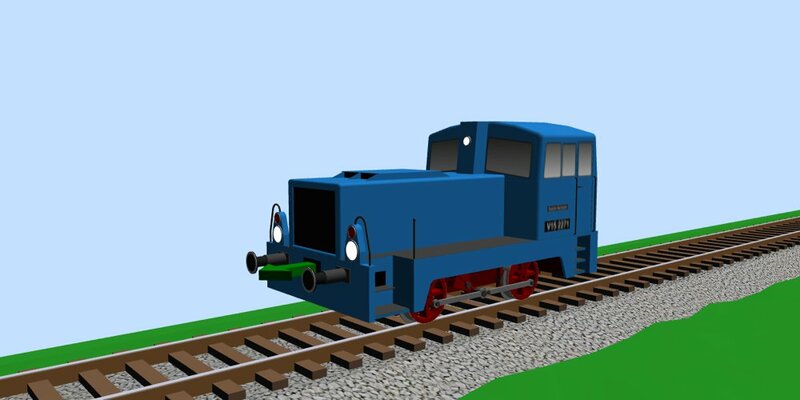 Base (proto): 2.5m; 8' 2.4"
The DR class V15 (redesignated as DR class 101), is a small and light, diesel-hydraulic locomotive with side-rod drive for light shunting duties, operated by the Deutsche Reichsbahn of East Germany. In 1959/1960 a pilot series of five locomotives and a first production run of 15 locomotives were built with 150 PS (110 kW) engines and numbered as sub-class V15.10. Beginning in 1960, further locomotives were built with 180 PS (130 kW) engines and marked as sub-class V15.20-21. This more powerful version of V15 with 180 PS (130 kW) was also supplied as V18 B to industrial railways. From V15 1026 on, the wheel diameter was increased to 1000 mm (39 in). Several batches of this type were built until 1966. The virtual model for SCARM MTS is based on mixture of details, taken from the prototype drawings and real scaled model in TT (1/120) scale, produced by Karsei. All major dimensions are preserved and most notable details are represented in the virtual model, incl. rotating wheels and moving rods in 3D viewing mode.